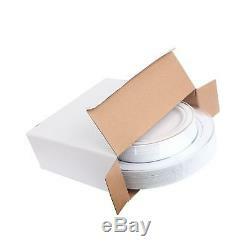 60PCS Heavyweight White with Silver Rim Wedding Party Plastic Plates, China Plastic Plates, 30-10.25inch Dinner Plates and 30-7.5inch Salad Plates -WDF (White/Silver Rim). 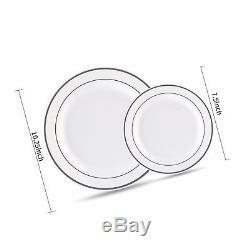 DURABLE COMBO PACK: 30 x 10.25" dinner plates & 30 x 7.5" Salad/Dessert plates, WDF uses the box to protect plastic plates well , so don&###x27;t worry the silver chips off and break easily. ELEGANT DESIGN: Looks like real china, those white plates with silver rim have elegant and exquisite appearance. Perfect for serving appetizers, wedding cakes, salads and desserts, tapas, fruit salads and any elegant event. SUPERIOR QUALITY: Using food grade, non-toxic, BPA-free, durable materials that ensures your disposable plastic plates aren&###x27;t break-resistant, also makes them feel more healthy and safe, enjoy your party! CONVENIENT AND SAVE TIME: When the party is over, cleanup is easy - Just throw those disposable dishes into the garbage or keep them and reuse it. So convenient and release your hands. PERFECT FOR EVERY OCCASION: Rich style and size, our disposable dinner plates and salad plates are the perfect dinnerware solution for events , Wedding Receptions, Graduations, Anniversaries, Birthday Parties, BBQs, Thanksgiving, Halloween, Christmas, Christmas Eve and more! 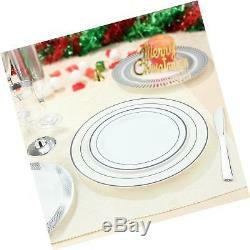 Color:White/Silver Rim WDF China plastic plates combines both timeless tradition and fashion trends. The silver rim plastic plates bring an elegant style to the kitchen, dining room, or even the wedding. Perfect choice for family meals and casual gatherings. STYLISH DESIGN-WDF Heavy duty china plastic plates have elegant and exquisite appearance, which make cook feel happy and make foods look delicious and attractive. In parties and gatherings, can improve the parties and gatherings levels. 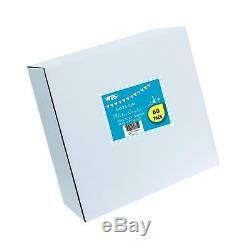 GIFT ELEGANT PARTY PARK -Durable package protect plastic dinnerware well. Suitable for daily life, also as gifts for families, relatives and friends. Make daily life more easy and pleasure, enhance each other's friendships and affections. EASY TO CLEAN-just gather the plastic plates set and dispose of it. 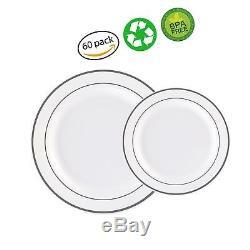 Durable plastic plates with silver rim- can be washed and then dried it , when the next event you can reuse again. SATISFACTION GUARANTEED -Your satisfaction is paramount! If you have any issues with our Silver plastic plates set , dont hesitate to contact our customer service team, we will provide the best service for you. NOTE - If you try to reuse and wash them , they may have slight cracks, but that does not affect your next use. Although our plastic dinnerware set are durable, We dont recommend putting it in a dishwasher and microwave, oven. You may return items in its original condition within 30 days. 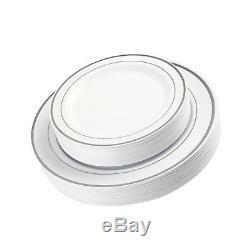 The item "60PCS Heavyweight White with Silver Rim Wedding Party Plastic Plates, China Pl" is in sale since Sunday, April 22, 2018. 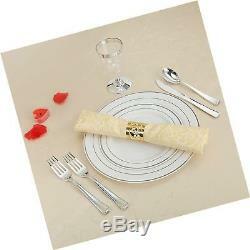 This item is in the category "Business & Industrial\Restaurant & Food Service\Tabletop & Serving\Tabletop\Disposables".